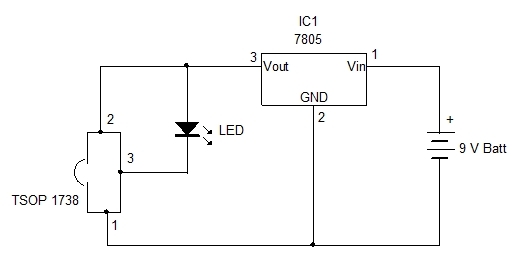 The Tester circuit is too simple and it uses only the IR Sensor TSOP 1738. It requires 5V, so the Voltage regulator IC 7805 is used since the power supply is 9V battery. If you use 5V DC for the circuit, the Voltage regulator can be avoided. TSOP 1738 is the IR Photo module that has a PIN Photodiode, Signal Amplifier AGC( Automatic Gain Control ) , and output transistor in a common package. 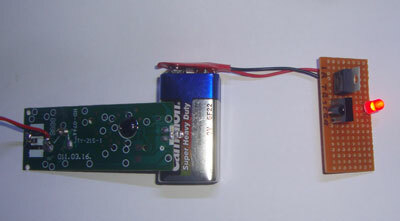 When 5V DC is provided, it gives a high output in its pin 3. That is, when the Sensor is not receiving the 38 KHz IR rays, its output will be high. Output will be around 3.3V with a current around 20 mA. But when the sensor receives Pulsed IR rays in the frequency 38 KHz, the sensor sinks current. That is, the output of Sensor turns low. A Red LED is connected between the positive rail and the output of the sensor with the Cathode of LED to the output of Sensor. So when the IR transmitter is focused on to the Sensor, LED blinks if the IR Transmitter is emitting IR rays in the 38 KHz frequency. 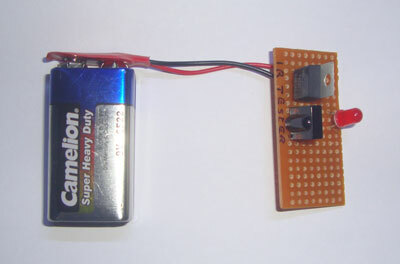 This Tester can also be used to test all types of Remotes like TV remotes that emit 38 KHz Infrared rays.